I've said it before, but I'm a total wimp when it comes to spicy food. My poor little taste buds scream in protest when I eat anything hotter than a bell pepper. For some reason, though, I just love sriracha sauce. It give food such a great flavor that I always look for ways to use it, despite the fact that I can only handle very small quantities of the stuff. This salad is my new favorite use for sriracha sauce, because it is so, so good. 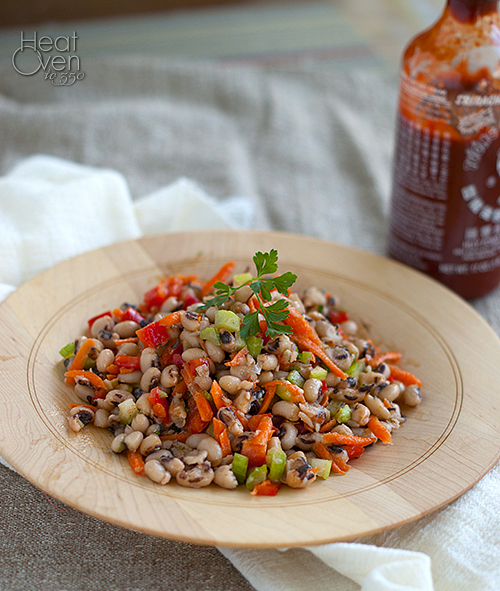 It's a great combination of textures and flavors, with the crunchy carrots and celery and the mild smoothness of the black eyed peas. The sriracha vinagrette is amazingly delicious with just enough of a kick. If your taste buds are heartier than mine (and really, most people's are) you can increase the sriracha to make this spicier. I cooked my own black eyed peas from dried beans because it is cheaper to buy them that way, but you can find them canned in some areas or in the frozen section. 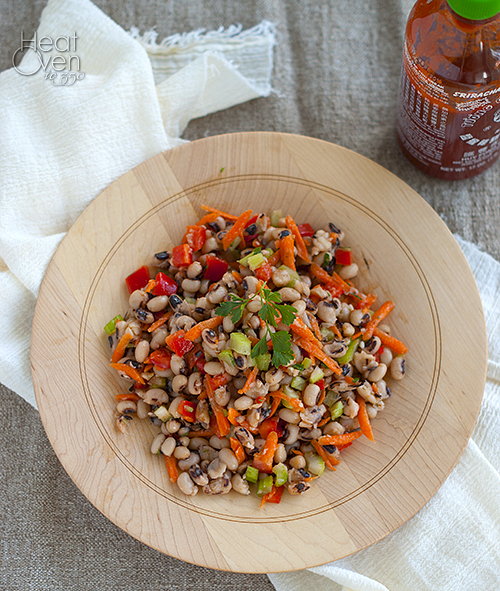 If you've never tried black eyed peas before, this is a great way to try them. It's a perfect potluck food, side dish, or simple vegetarian lunch. Whisk together vinegar, olive oil, Sriracha and salt in a large bowl. Stir in black eyed peas, celery, carrots, bell pepper and parsley. Season to taste with salt and vinegar. Serve. This is a very unique salad! I love going to Whole Foods and trying to replicate their salads -- they're always so good. I would love this. I grew up eating black eyed peas and I haven't had any for ages. The spice sounds mighty good! yummy! I love spicy things, although there are still levels of spice that even i can't handle. It's not fun when it's so spicy you can't taste. Srirachi adds just the right amount of spice and flavor though, so I can see why you like it...and on this salad it seems like the perfect touch! I really need to start buying dried beans...not only are they cheaper but I heard that canned things aren't good for you. I just never have the foresight to hydrate them the night before I want to use them! Me, too! The good thing about black eyed peas is they hydrate so quickly they are one of the few that don't require an overnight soak. Sweet! You pretty much had me at sriracha! information please visit our site: www.healthyrecipeverified.com .